KAMPALA — Jimmy Lwamafa’s proverbial 40 days have left him haggard. It is difficult to imagine how many thoughts were racing through the mind of the former Permanent Secretary at the Ministry of Public Service and Labour as he head back to Luzira Prison on Wednesday. Yet it is also so easy to draw up a conclusion on his state of torment. 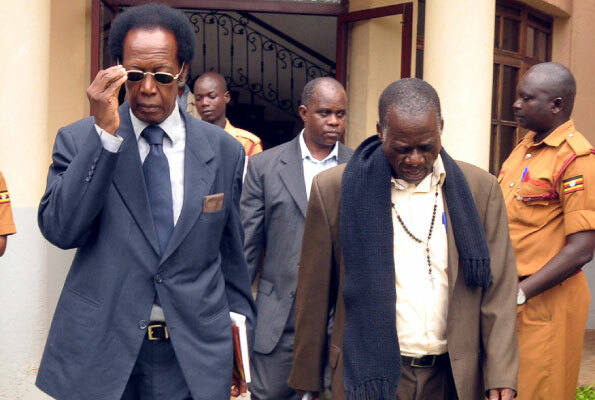 On Wednesday the Court of Appeal granted bail to Lwamafa and his accomplice Christopher Obey but the bail was nothing short of absurdity as the two were herded straight back to prison because of other pending charges against them in the Anti-Corruption Court. Lwamafa must have both envied and pitied his second partner in crime Stephen Kiwanuka Kunsa, whose plea for bail was trashed with the disdain of a hungry man swatting away a fly hovering around his lunch stew. Envied Kunsa because at least he wasn’t humiliated with a meaningless bail, and pitied him because the convict cited serious health problems in his bail application and had substantial sureties—albeit not convincing enough to the court. Former PS Lwamafa, Obey, a former principal accountant in charge of pensions at the Ministry of Public Service, and Kunsa, a former director of research and development at the same ministry, have been dubbed ‘the three pension thieves’ by the public and the media since their conviction, in November last year, for causing financial loss of Sh88.2 billion and abuse of office. The ‘three pension thieves’ were on August 19, 2015, charged with several counts related to irregular budgeting of National Social Security Fund (NSSF) and misappropriation of Sh88.2 billion allocated for the Fund. Justice Lawrence Gidudu, who sealed the fate of the three former civil servants, said the Sh88.2 billion was siphoned through a syndicate they had carefully orchestrated at various stages involving different institutions, including Bank of Uganda and Cairo International Bank. The judge found the convicts guilty of fraudulently budgeting for Sh88.2 billion of pension money that they claimed was supposed to be contributed to NSSF— the ministry does not budget for pension remittance—and confidently waited at the other end for the money to be wired and diverted to their own parties. For many civil servants that engage in abuse of office and siphoning of public resources in the country, there is always that feeling that somewhere somehow, a stronger rock would shield you against a fatal fall when the net of the law covers you up. Lwamafa must have seen that guardian rock in the shape of a bail application as many convicts, once bailed, live their life happily thereafter until the State loses interest in the case. But this was not to be. They were released on bail but were driven back to Luzira prison. They still have another pending case in the Anti-Corruption Court related to forgery of a judicial document to steal Sh15.4 billion of pension money. Lwamafa had already spent 14 months on remand, a factor that played in Judge Gidudu only handing him seven years once his advanced aged was also factored in. In his late sixties, one of the gnashing thoughts running through his head is why he had not retired into his seated opulence before the cracks appeared. How much more humiliating would it get for him on being asked by Justice Steven Kavuma to deposit land title of his palatial residence as part of the bail condition. The house is on Plot 13, Yusuf Lule Road in Nakasero, Kampala. The three pension thieves have appealed their conviction, asking that the Court of Appeal puts aside the lower court’s decision to hand them jail terms. Kunsa is serving five years and Obey 10 years in jail. Deputy Chief Justice Kavuma, who ruled on their bail application, said there might be a delay in the hearing of the appeal and saved them an even more sobering humiliation for a financial crime of that nature when he rejected the prosecution’s prayer that court orders the convicts to deposit Sh3 billion and their sureties to commit Sh10 billion. Kavuma might have saved the ordeal here but it no doubt left Lwamafa and Co wondering just how much more they risk seeing the rock upon which they stood fall apart. “Such conditions are not in my view reasonable and they would in practical terms amount to a denial of the application for bail pending appeal without saying it in many words,” Justice Kavuma said in the ruling. Lwamafa will not forget the words. Piercing words that Kavuma couldn’t have put any better. Denial of right to appeal without saying it in many words is what the billion shillings bail condition would amount to. On Lwamafa’s haggard shoulders and furrowed conscience hangs another desperate prayer that Evans Ochieng, his counsel, manages to throw a ballast strong enough to steady the ship that is already submerged with him before it hits the floor of the sea. Should Counsel Ochieng fail, Lwamafa will stare at a coup de grace worth Sh50 billion in compensation to Government in his face. A bold type face in his crime and punishment episode.